The Thai movie industry has been in crisis over the past few years in terms of revenue, quality and lack of variety. Box Office receipts offer clear evidence that Thai movies can hardly turn a profit. Most turnover less than 10 million baht in revenue, the minimum needed to cover basic production costs. One may argue that Thai audiences have lost faith in their local product. With a challenging economy at home, audiences will not risk pricey cinema tickets whereas top Hollywood movies are a safer bet. Thai movie-makers are struggling for solutions to this crisis. Some have moved to a new movie-making model by focusing on local people’s interests to attract rural audiences. Some chose the simplest solution by making glossy-looking movies to attract the urban middle-class teen audience. 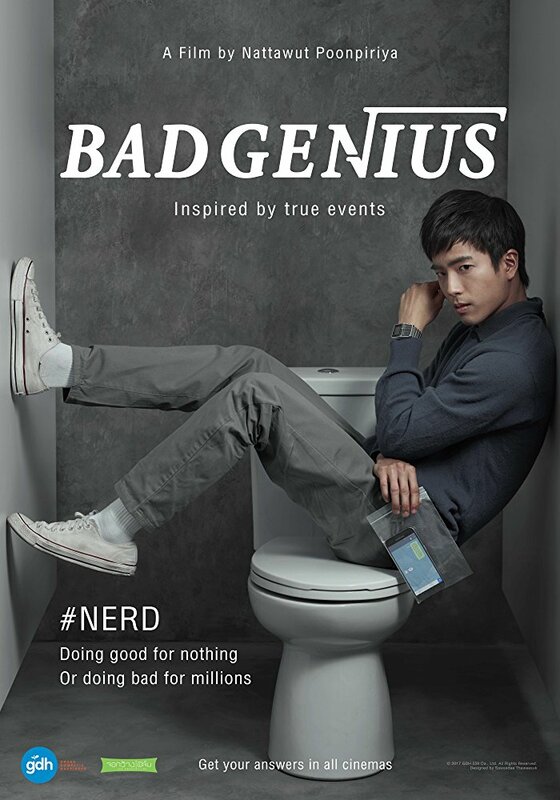 Bad Genius illustrates the popularity of this genre. Behind the success of Bad Genius is GDH 559 Studio with is currently the hottest studio in Thailand. It has a huge fan base of mostly middle class teens and it employs a number of celebrated directors and performers. Generally, the studio excels in the ‘feel good’ genre therefore it came as a big surprise that it got behind a ‘thriller’, usually not considered a money-maker in Thai cinema. The success this endeavour has seen could bring some changes to Thai cinema. Turning things around, Nattawut Poonpiriya, the director of Bad Genius, came good following the critical and box office failure of Countdown (เคาท์ดาวน์) in 2012. In Bad Genius, he focuses on the thriller genre and works in the issue of ‘moral dilemma’ as the theme of the movie. Bad Genius portraits a story of Lynn (Chutimon Chuengcharoensukying), a female student who was the top student of her school. Grace (Lynn’s close friend) asked her for answers during a school’s exam. When Pat, Grace’s rich boyfriend, found out, he had the idea to start an exam cheating business with Lynn’s consent. Naturally gifted, Lynn could easily answer exams questions and funnel these answers to fellow students, their ‘customers’. The business was a hit and Pat wanted to cheat in an international test called STIC. This time, Lynn needed help from another genius student, Lynn’s educational nemesis, named Bank. How might Lynn persuade him to assist her in this challenging ‘business project’ since Bank was an honest student who abhorred cheats? The most interesting part of Bad Genius is in how the cheating plays out like a heist movie in the thriller genre. Director Nattawut moves the narrative along with a fast-paced dynamic tone that might be compared to the casino robbery in Hollywood’s Ocean’s Eleven. Although the design of the situation seems unreasonably surreal, the cheating seems to take place for pure entertainment’s sake. The director’s experiences in advertising and music videos is reflected in the movie’s striking cinematic techniques. The production values are up there with Hollywood standards and it suits the thriller genre perfectly. Furthermore, the cast, particularly the skills of the leading performers, are above those normally seen in Thai cinema and they bring the narrative alive. However, there are also flaws in the over-stylisation. At times, scenes can become too gimmicky and they lose authenticity. In addition, some symbolic aspects of the movie are too obviously expressed, like in the overly cinematic language which brings an unrealistic edge, especially in the execution of the last scene. This movie might not criticise the Thai educational system directly but its story clearly reflects perennial problems in the Thai system. Similar to many countries in Asia, the capability of Thai students is not measured by their application of knowledge but by their memorisation ability. We do not go to school to learn things useful for our lives, but we go to take tests for scores that, supposedly, will guide our ‘future’. After exams, this knowledge expires leaving few real-world skills. The teenagers in this movie do not play by the book, however, they still serve the society’s system that judges students by their “excellent scores”. One interesting aspect of the story is the crucial element of money in education. Showing no guilt, Lynn chose to cheat with no guilt in exchange for “money”, something that she did not have before. The movie shows socio-economic inequalities as Lynn had to fight hard for a scholarship to study abroad while Grace and Pat’s rich family could easily secure their seats overseas. Lynn felt that her life was a fraud from the start so she cheated without guilt. The movie may reflect Thai society in a thoughtful way but there was a shallow twist in the story allowing the ending to comply with the Country’s high morals as the standard bearer under the Thai governing junta. Unfortunately, the twist at the end shows a lack of credibility, and worse, imagination. Bad Genius would have been more memorable if it left audiences with the opportunity to think about the moral dilemma it poses. Let’s get back to the success factors of this movie for the Thai Box Office. At present, cinema visits are considered as entertainment for the urban middle-class, especially as ticket prices are almost impossible for the working class to afford. Middle-class audiences have fussy tastes and the privilege to choose which movies they want to see. Bad Genius fits the bill as it fulfils this middle-class expectation. Beyond that, we will see how Thai movie-makers develop new approaches and put more effort into keeping the Thai movie industry alive by serving the keep-changing taste of the urban middle-class. For you guys, what should have been the ending of this film?